The AC Dayton XL-5 was normally produced having a wooden cabinet but a few sets were produced featuring a special plate glass cabinet. These glass cabinet sets were never intended to be offered to the buying public but were, instead, used by dealers as demonstration sets. 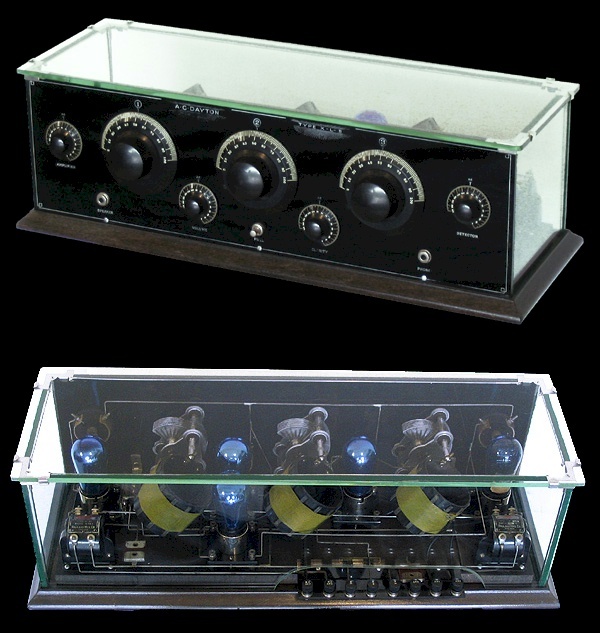 The company must have received a lot of positive reception for the glass cabinet XL-5 because in the following year, the company offered a glass cabinet version of their XL-25 radio. I acquired this radio, in 1992, from Ed Bell by offering, in trade, a complete 1928 Leutz Transoceanic receiver with B/C power supply. I acquired the Leutz receiver from Joe Koester in trade for a 1936 E. H. Scott All Wave 23 in a Laureate Grand cabinet which I originally bought from Chicago resident, Mel Fragassi, a retired engineer who used to work for Scott.